Hopefully humor sets this wolf picture apart from its competition. A friend of mine has a Husky that looks a lot like a wolf. That got me to thinking…could I create some wolf images that weren’t like everything already out there? I checked Getty and, I have to say, there are a lot of great wolf images! But it still looked to me as if there was room for a few more “interpretations”. I put together a list of images I wanted to create ranging from an iconic version of a wolf howling at the moon to a portrait to a wolf huffing and puffing and, well, you know. I have photographed a lot of animals, and the shoots seldom go as planned. This shoot was no exception. I had an extensive list of poses I needed (Think Little Red Riding Hood, Huffing, Puffing And Blowing, etc. ), but the Husky would have none of it! Every time the strobes popped off she started. Normally after the first couple of flashes the animals don’t pay any attention, but this little doggy never did get over her nervousness. All she wanted to do was lie on the floor and look forlorn. Sure, she enjoyed the dog treats, but preferred to eat them from her prone position. The shoot was a struggle from start to finish, and after an hour we decided to call it a day. I didn’t get what I wanted, but I felt like I got enough material to make some cool images anyway. Today I sat down to see if I could make some of the captures work. This "Evil Portrait" is the first image I came up with. 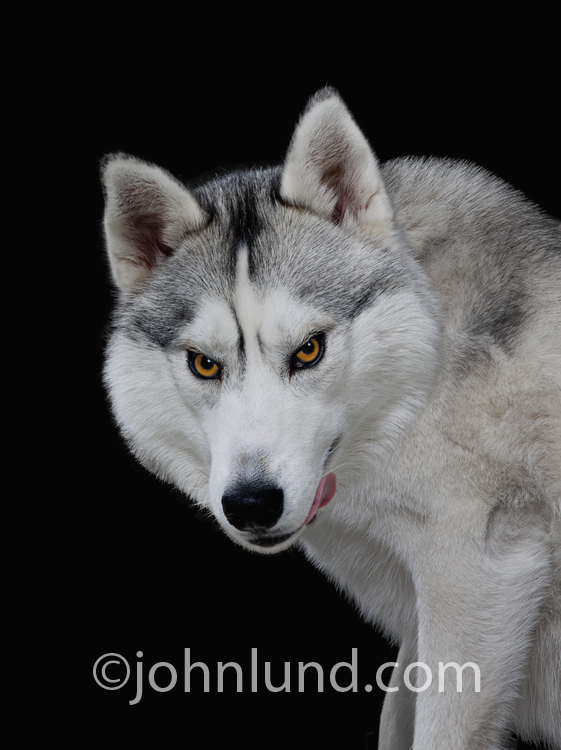 Now there are no shortages of wolf portraits out there, but as far as I know this is the only one that brings in the element of humor with an over-the-top sinister expression combined with having the wolf lick her chops. Hopefully the humor will make this image stand out. I combined three different images to complete this wolf portrait. One shot was the body, one the head and face, and one was the tongue. I also made a variation with a forest of trees in the background. I am submitting both to Getty, but I prefer the wolf on black. We will see what my editor prefers, or even if he is interested at all. One never knows! I see this image as a Rights Managed one because I don’t envision a lot of sales, but I see it as being perfect for a few applications. Also, I prefer the higher royalty rate I get from RM images (though from experience I know that I can make just as much total revenue form RF images as I can for RM...and RF tends to be more consistent). At any rate, there is no question that the shoot will be successful financially…it cost me next to nothing to shoot and I have enough material to create at least half a dozen images. Hey, and most importantly, I am having fun!